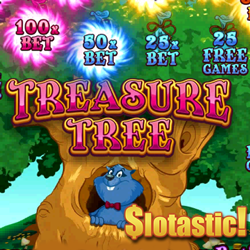 Have you tried the new Treasure Tree match & win game that launched at some online casinos powered by Realtime Gaming? It's easy and fun and Slotastic Casino is offering a sweet bonus for it, available until the end of the month. Treasure Tree is a match & win game meaning you place a bet and then select objects (money bags hanging in a tree) to reveal prizes. You can win up to 25 free games or up to 500X your last bet. There's a new game in Slotastic’s mobile casino (http://www.slotastic.com/mobile) this week too! At last the Achilles slot is available for smartphones and tablets. It takes bets from a penny to a hundred dollars per spin so lots of different kinds of players like it. Treasure Tree is first match & win game from Realtime Gaming. The new tap and swipe version of the Achilles slot game is destined to be a hit in Slotastic’s mobile casino. Achilles players can bet just pennies when they’re watching their budget or bet up to $100 per spin when they’re feeling lucky.